electro-music.com :: View topic - How do you tell the pin out on old transistors? How do you tell the pin out on old transistors? 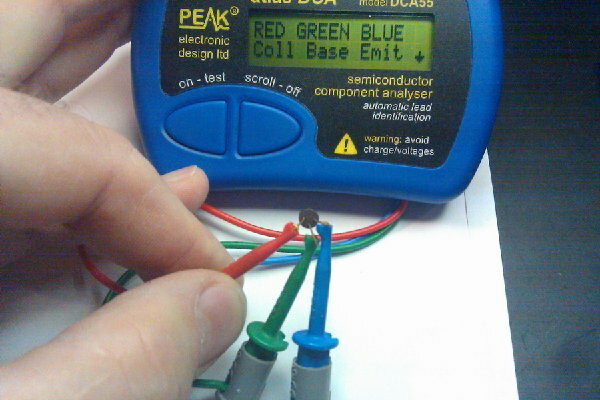 Posted: Fri Dec 17, 2010 7:27 am Post subject: How do you tell the pin out on old transistors? Got around to putting in the last components in the Steiner VCF yesterday: the parts had just arrived from USA after the normal long postal delay. But then...a mystery. My PN5138 and 2N5172 are not the normal TO-92 packages but are vintage ones: the former looking like water towers and the latter having a kind of skirt. So I am not at all sure of the orientation or even if they have the same pinout as the TO-92 packages which have datasheets. (The pins are in a triangle, not a straight line). Back in the day... (early 1970's) If you looked at a transistor from the bottom, oriented the Base of the transistor south, the Emitter was East. I don't know how universal it is/was - but it worked for me back then. Posted: Tue Dec 21, 2010 3:26 pm Post subject: Re: How do you tell the pin out on old transistors? The 2N5172 has an BCE pinout (top view, flat away) and will install in the PCB by lining up the flat as indicated on the PCB. If you are using them in the spots labeled for the SSM2210s, you will have to twist the leads to get them installed, use one of the discrete transistor silkscreen as a guide. This is one of an old 2N5138 which I bought in 1974. I'll try to post a couple of photos tonight.